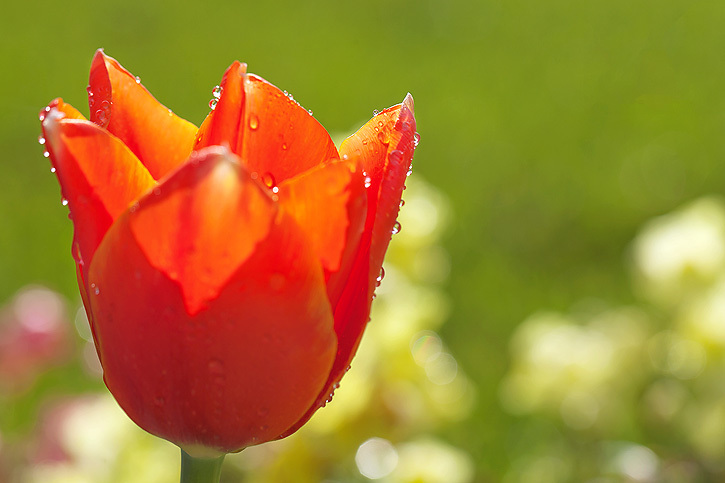 Today I'm sharing a few more tulip images. I found this lovely flower on my morning walk covered with little beads of moisture. It made for really fun close ups in the beautiful morning light with my macro lens. Now it's time for you to share what you've been shooting! There are just a few rules. They make me smile, Deb. Gorgeous! Oh Deb - these are beautiful! Ok, I am swooning here Deb! These are beyond stunning!! I love these! Tulips are my favorite flower.. The water drops look amazing! These are gorgeous Deb!! Now you have inspired me to get back to marcros. Love the color too. Beautiful! My favorite flower. I miss my tulips at my old house. I wish now I would have planted some bulbs here last fall. Those bright tulips make for a very jolly image, with the bright green background and the fancy droplets. Beautiful Deb...the colors and the droplets are fabulous! My post shows water droplets today too! The tulips are beautiful...I am totally in love with my macro lens. Can't wait to get a really good one! Wow! I never look that close! I'm going to start right now! Beautiful! Visiting earlier, I had spotted your tulip in Color me Weekly, it is stunning. The droplets catch the light to add effect. Hope you have a gorgeous day. I need to start taking morning walks. 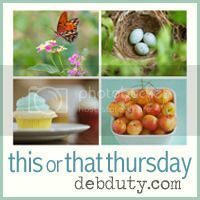 ;) That first shot took my breath away as I pulled up your blog, Deb. Gorgeous! Those are amazing. I have been asking my hubs to pick up some tulips for a while now. I will have to ask again- you have inspired me! GORGEOUS Deb! I have the same feeling at Henrietta, WOW look at the bold coral! Oh goodness! You always do such lovely macro shots. LOOOOOOVE the vibrant colors. 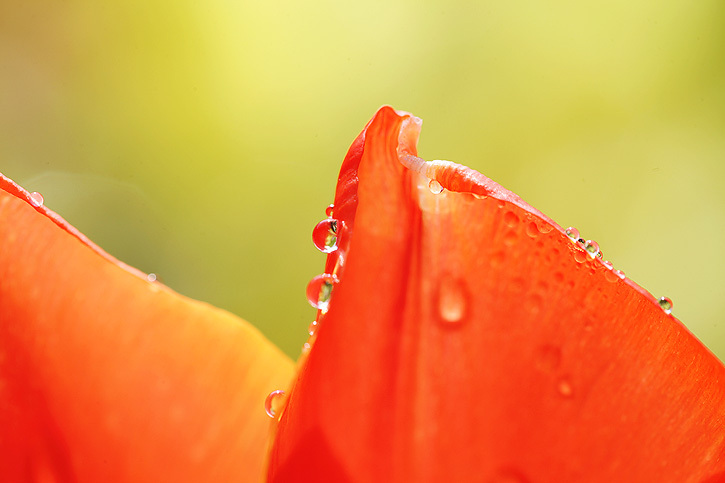 Amazing focus on these tulips and dew drops; excellent! Deb, these are stunning pictures. The colour of the flower and the detail and light you have captured are wonderful and the dew drops are like little diamonds. Lovely!!! Beautiful! The colors are just fabulous! 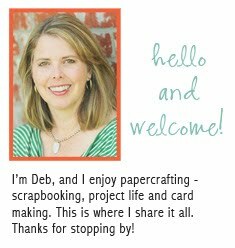 Your pictures are always stunning, Deb! Love the water droplets. Your tulip images are stunning. I love these photos! Tulips are my favorite and your captures are just beautiful. Makes me want to frame them and hang them in my house! Just beautiful! LOVE the color of that tulip! I love that photography gives us a chance to stop, notice, and appreciate beauty such as this. Great images! Absolutely gorgeous photos! The colors and details of the dew drops are just stunning. 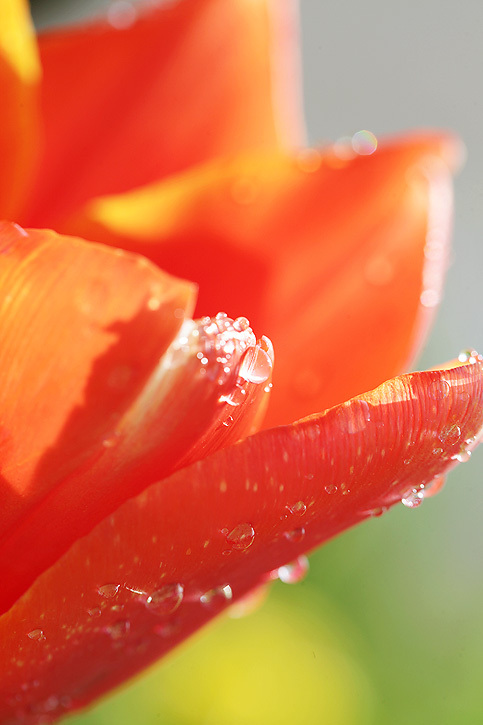 Beautiful tulips and those water drops are spectacular. Red is sometimes difficult to capture, but this is really wonderful!! Really gorgeous colour and those drops of dew are crisp as anything! Oh wow, Deb! So beautiful! Beautiful, I've been playing with water and roses this week. Just love the color of these! WOW!!! Amazing. What lens did you use? deb these are amazing!! truly!! Oh my, these are absolutely amazing! The light, the color, the bokeh...I am in awe and so inspired! Thank you for sharing and for hosting this link up. 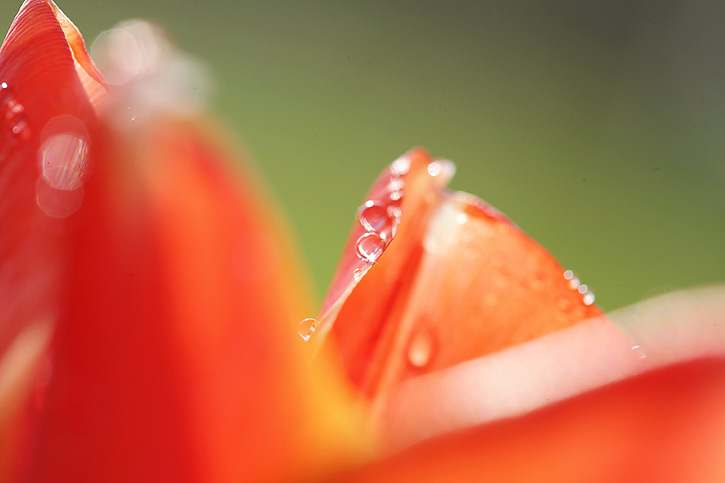 Whao...love the close up of the tulip.. down to the water droplet on it..really amazing!! WOW Deb!! TRuly amazing shots! My favourites are the first and the third. Gorgeous. Absolutely beautiful!!!! Tulips are my most favorite flower and these photos are amazing!! These are incredible photos! The colors and details are fantastic! :) I tried to link up, but it didn't work. Sad. These are beautiful! I just got a macro lens, and I'm still trying to figure it out. Very nice shots! Still wishing spring would arrive in my parts! Here I was thinking it was on it's way and then it snowed again last night! Have a great weekend! Wonderful macro with fantastic light and color. I love these flowers. Oh dear!! I nearly fainted dead away when I saw these shots! ABSOLUTELY INCREDIBLE!! Your nature shots are my absolute favorites! These flower shots are so colorful and happy... but at the same time very calming. Gorgeous! !